The Law requires that any chemical placed on the market in Europe must have the hazards clearly communicated to workers and consumers. This is done through the classification and labelling of the product. Up until 1 June 2015 this was controlled by the CHIP Regulations (Chemicals Hazard Information and Packaging for Supply), but this has now been revoked and replaced with CLP Regulations (classification, labelling and packaging of substances and mixtures) and with this change comes new symbols and phrases that explain the hazards relating to that particular product. One of the main reasons for this change, was to adopt the Globally Harmonised System (GHS) on the classification and labelling of chemicals, which basically means that the symbols will be the same across the world rather than having each region with their own classifications and symbols. Another element that has changed with the new regulations is the description/s of the hazards relating to the particular product. Previously these were called Risk phrases (R phrases) and they have now been replaced by Hazard Statements. For example if a product was classed as flammable it would have the risk phrase of ‘R10 – Flammable’, under the new regs this would translate to ‘H226 – Flammable liquid and vapour’. 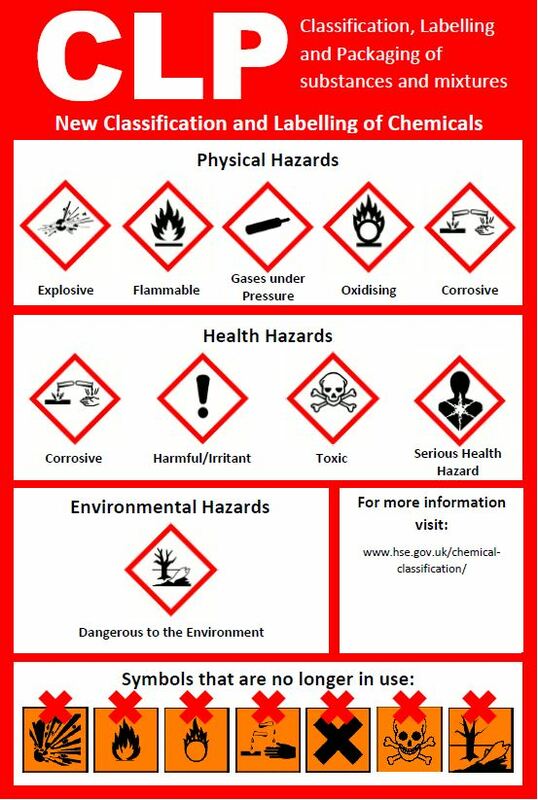 The European Chemicals Agency (ECHA) website has a page describing all the new symbols and what has been replaced. As of 1 June 2017, all manufacturers of hazardous chemicals must now be using the new CLP system for any product it supplies to clients which will include new labelling and SDS (Safety Data Sheets). An SDS is a document that contains information on the potential hazards (health, fire, reactivity and environmental) and how to work safely with the chemical product. speak to your chemical suppliers if you have any questions or if you don’t understand the changes that have been made. follow the advice provided on the new labels and, where appropriate, in Safety Data Sheets.